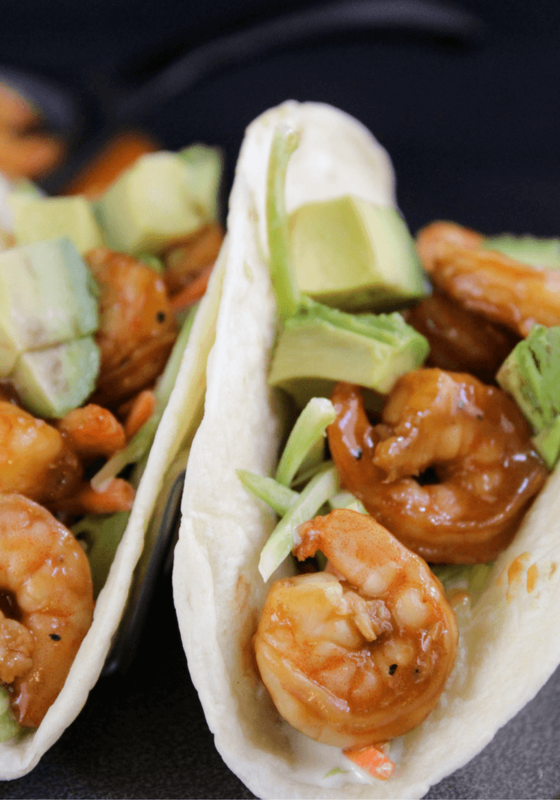 Mongolian Shrimp Tacos made with a quick broccoli slaw and tasty shrimp marinated in new P.F. 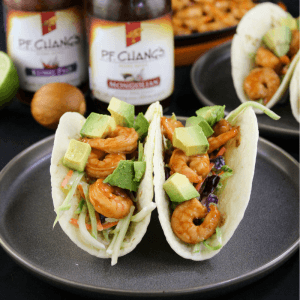 Chang’s® Home Menu Sauces topped with fresh avocado all wrapped up in a flour tortilla. 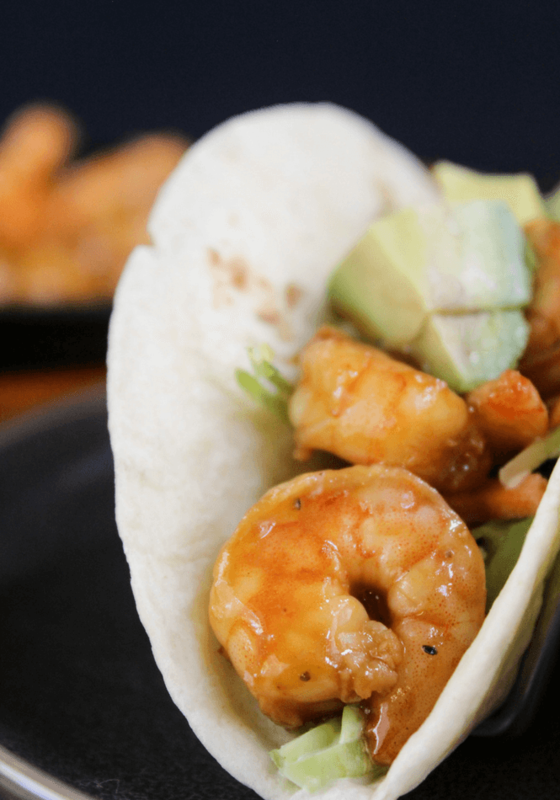 These Mongolian Shrimp Tacos are perfect for any day of the week. 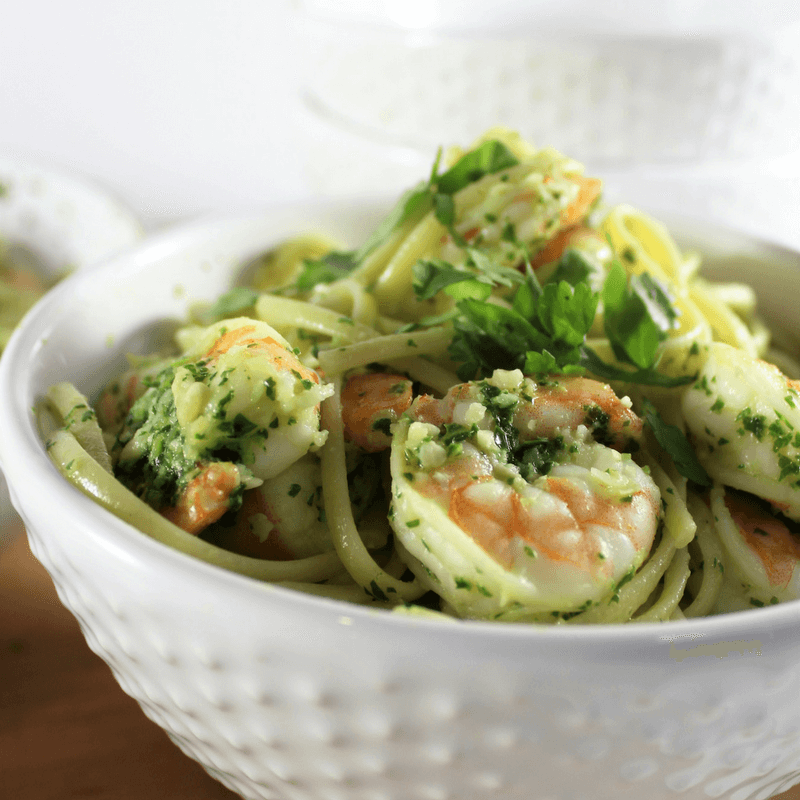 Quick, easy, convenient and packed full of flavor. Exactly the type of recipe that moms, like myself, survive off of. These tacos can be on the table in 35 minutes and that includes marinating time. I also recommend trying this recipe out sometime utilizing the P.F. Chang’s Home Menu Sauces in the Kung Pao flavor. Delicious! New P.F. 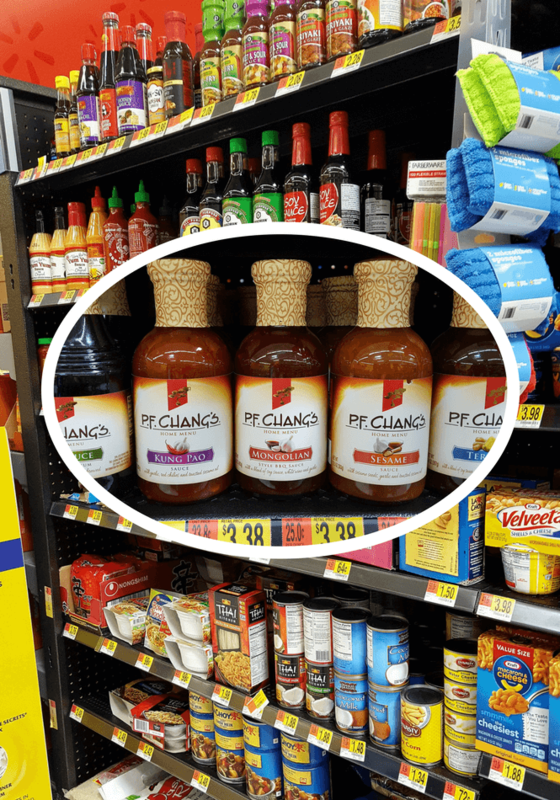 Chang’s Home Menu Sauces in Mongolian and Soy can be found at Walmart on the Asian food aisle. You will also find the three existing flavors – Teriyaki, Kung Pao, and Sesame. 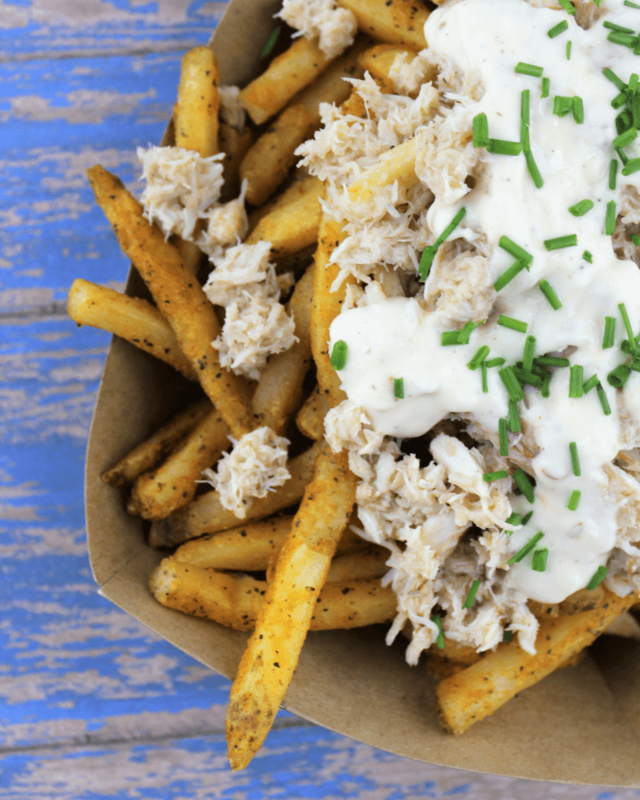 Dinner doesn’t have to be complicated! Try P.F. Chang’s® Home Menu sauces to bring an authentic cuisine to your family in a snap. Bring on taco night! Tacos are frequently on the meal plan in this house because it’s easy to toss together and just so darn tasty. 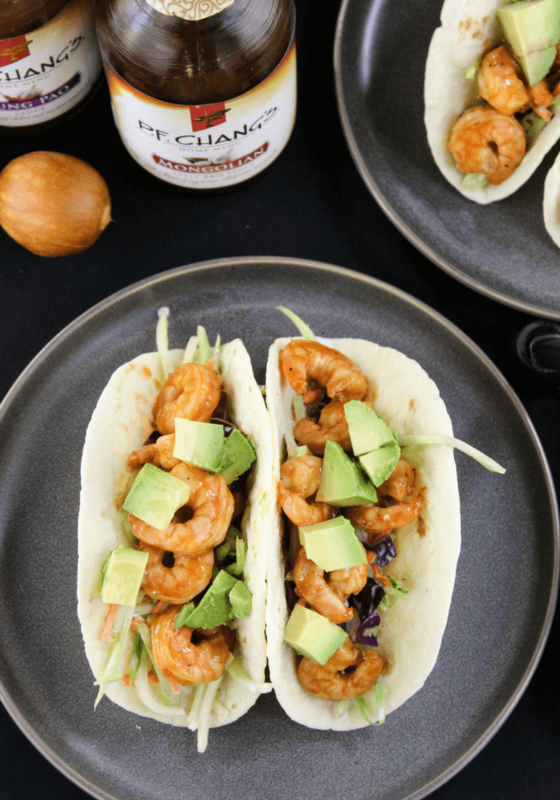 These Mongolian Shrimp Tacos are a nice switch up from the basic taco night. What makes these tacos amazing? Marinating the shrimp in the P.F. Chang’s Home Menu Sauce Mongolian flavor. It adds all the awesome flavor in these tacos without any complicated steps. Just marinate and cook for a few minutes on the stove. Time to get cooking! I bought my shrimp peeled and deveined to save time and effort. 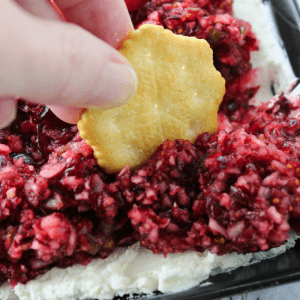 Toss the shrimp into a sealable bag or container with 1 cup P.F. Chang’s Home Menu Sauce- Mongolian. Let the shrimp marinate for 30 minutes and prepare the Cole slaw. This Cole slaw takes only a minute to whip up. Purchase the premade broccoli slaw, add diced jalapeno, minced garlic clove, lime juice, mayonnaise, honey, salt and pepper. Mix thoroughly and done. You can julienne some broccoli stalk and carrot to make your own broccoli slaw but the premade just makes life so much easier. 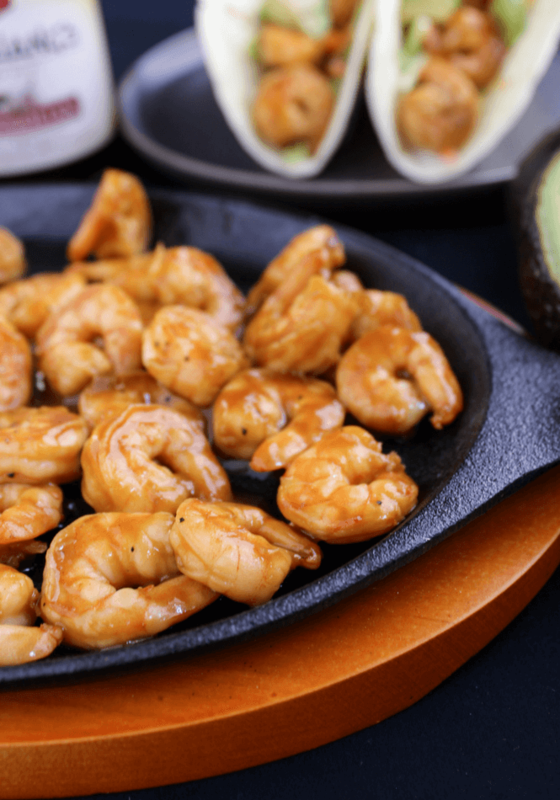 Once the shrimp has marinated a bit, heat up a pan on the stove on a medium-high heat. Add some olive oil and then drop each shrimp into the pan to cook for 2 minutes each side. Once cooked, add 1/4 cup of P.F. Chang’s Home Menu Sauce- Mongolian. 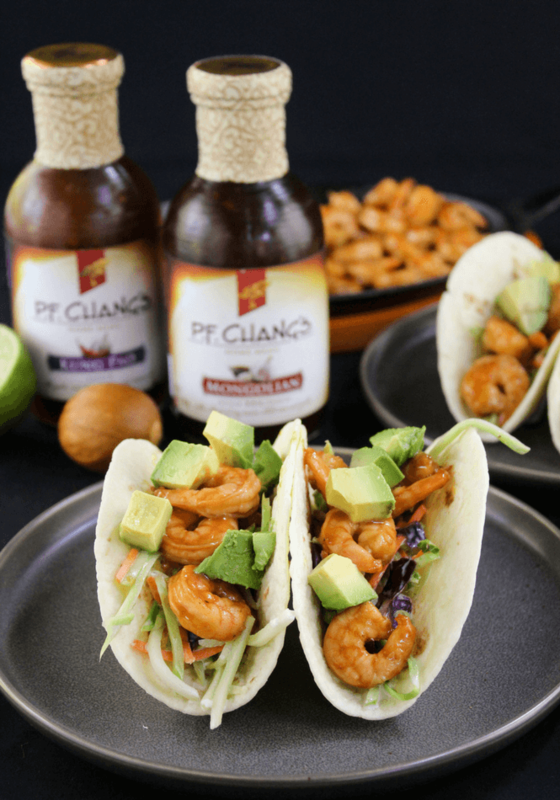 Give the shrimp a toss in the pan and chow down some Mongolian Shrimp Tacos. If you want an extra kick of spice with these tacos, add a simple taco sauce using 3 tablespoons mayonnaise, 1 tablespoon hot sauce and a pinch of lime juice. 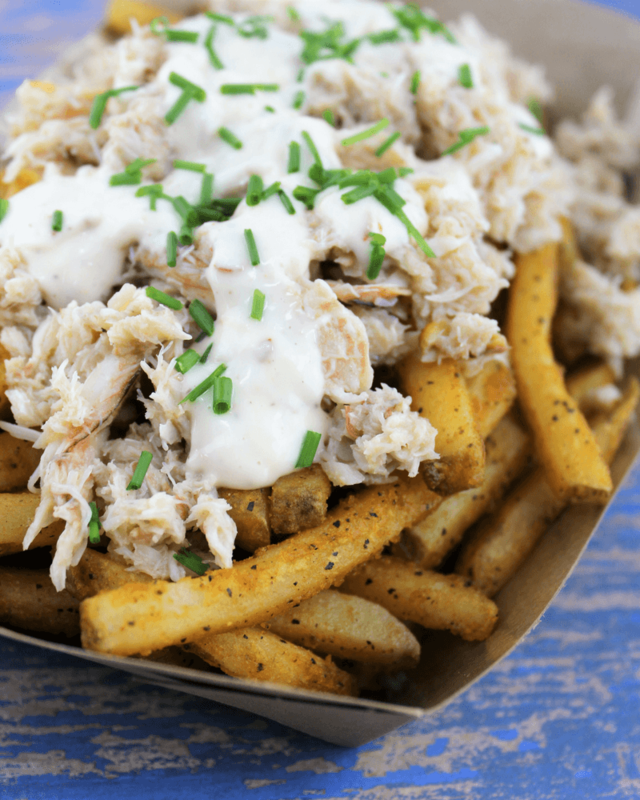 Drizzle on top. Oh yeah, taco night is in full swing! Place 1 pound of shrimp into a sealable bag with 1 cup NEW P.F. 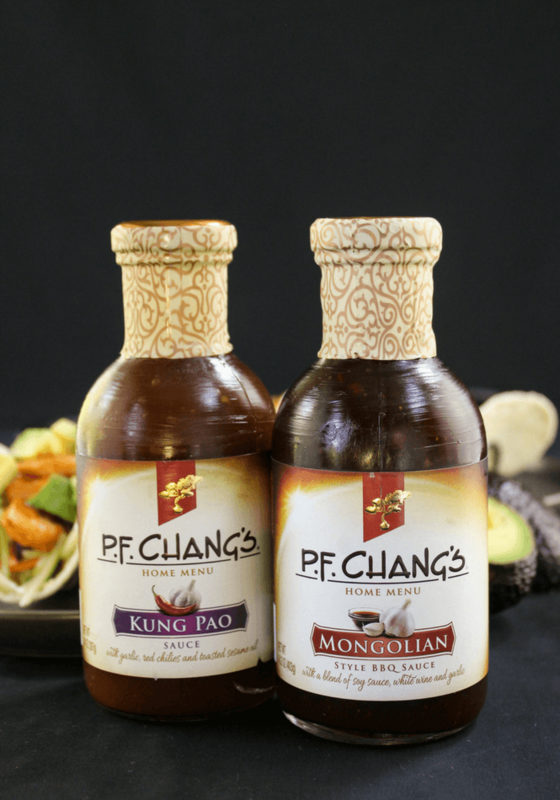 Chang's® Home Menu Sauce - Mongolian. Let marinate for 30 minutes. Prepare the cole slaw. 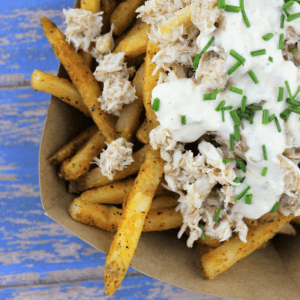 Add your 10 ounce cole slaw bag contents into a bowl with 1 clove minced garlic, 1 finely chopped jalapeno (remove seeds before chopping if you do not want too much heat), 1 tablespoon lime juice, 2 tablespoons mayonnaise, 1 tablespoon honey and a dash of salt and pepper. 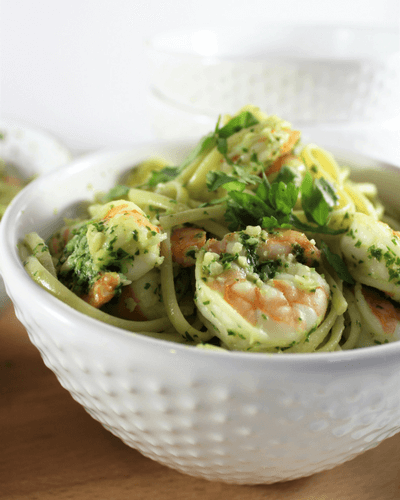 Mix ingredients together and let soak while the shrimp marinates. Stir again before serving. 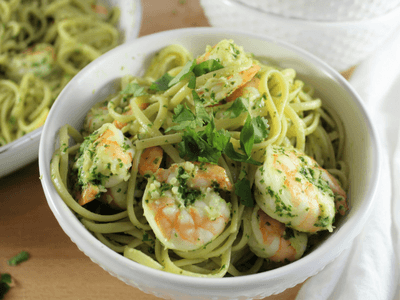 On a medium high heat, add 1 tablespoon olive oil to a pan and add shrimp. Cook for 2 minutes, flip shrimp and cook another 2 minutes. Add in .25 cup NEW P.F. Chang's® Home Menu Sauce - Mongolian to shrimp and give a good toss to distribute sauce evenly. Remove from heat. Build your tacos. Place the cole slaw on the bottom of each tortilla, place 5-6 shrimps on top, and add a few avocado pieces. Have you tried any of the P.F. Chang’s Home Menu Sauces yet? 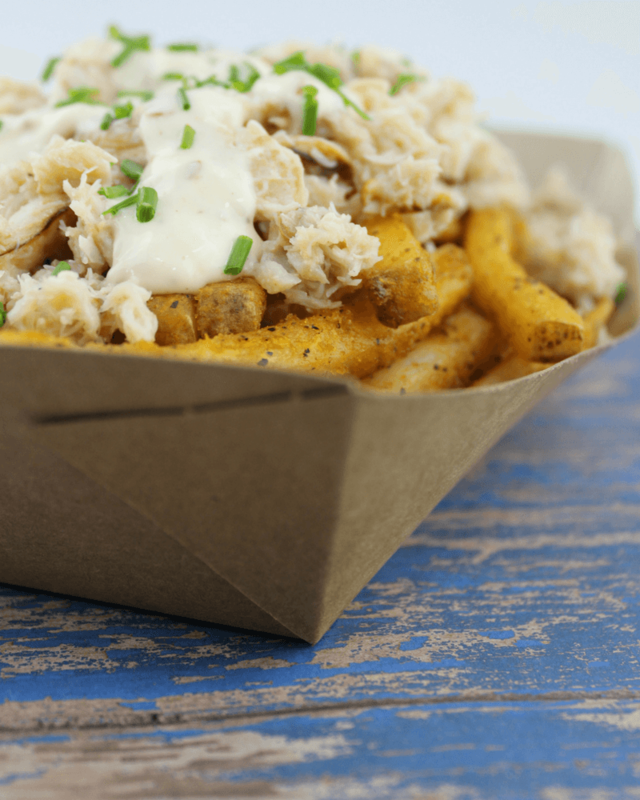 Find some more recipe inspiration HERE. 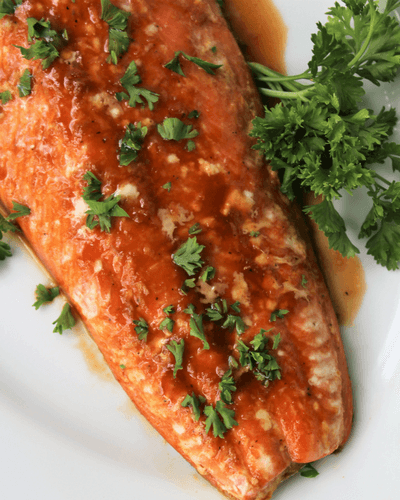 Sweet ‘N’ Spicy Baked Salmon with honey and a bit of sriracha, garlic and soy sauce. Simple, healthy and quick meal that pairs well with rice and broccoli. There are only a few meals in my family that everyone can agree on. Salmon is one of those. My son is against Italian food in general. I know, there might be something seriously wrong with him but I’m hoping he gets over it soon. My daughter is only 2 so she has a hard time chewing some foods or they are just too messy for my patience level. Thank goodness for salmon though! 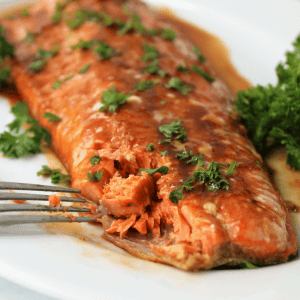 Salmon is great because you can use so many different marinades to get different flavors your family enjoys, it is healthy, quick to prepare and cook, and it tastes amazing! 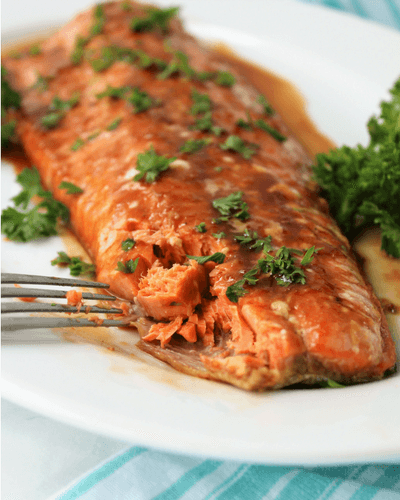 I have talked about how to pick out salmon a few times here on the blog. 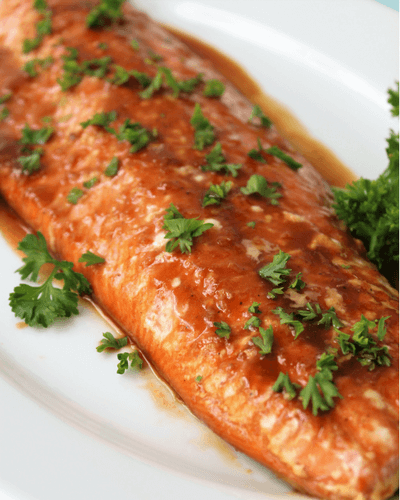 Check out the Lemon Garlic Salmon. I recommend buying a wild caught salmon and look for a bright and vibrant pink color. Salmon should not have a strong scent or a dull greyish tint. When my store has wild caught Sockeye, I buy it! One of my favorites. 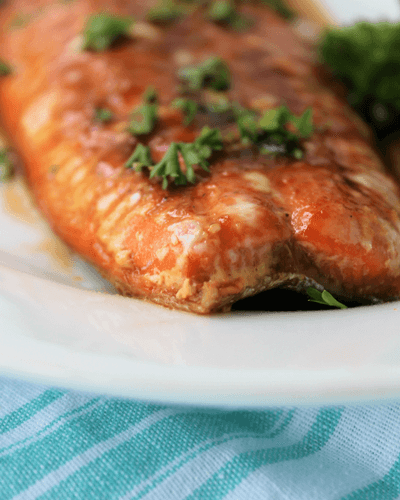 Sweet ‘N’ Spicy Baked Salmon tastes both a little sweet and a little spicy. Duh, Amber. Honey always adds the perfect amount of sweetness when cooking. Sriracha brings in a bit of heat but is not overwhelming. If you want it extra spicy, add more sriracha. Soy sauce and garlic are also added into the marinade to give more flavor and a bit of an Asian cuisine taste profile. Garnish the salmon with any kind of herb you like. I sprinkled some parsley on top today because that is what I had on hand. Scallions would have also be a nice touch. You may notice that I almost always leave the skin on the salmon when cooking and I cook the entire fillet. It just makes life a little easier. The skin pulls right off after cooking and it is easier to portion out the kids dinner and the adults dinner from a large fillet. If you like the skin off before cooking or in pre portioned sections before cooking, go for it. Make sure to put some marinade or olive oil on both sides of the fish if removing the skin. Place the salmon on top with the skin side down. In a medium bowl, add sriracha, honey, soy sauce, minced garlic cloves and olive oil. Mix well. Place salmon in oven for 20 minutes.